This farm forms part of the Ragley Estate and is adjacent to Tot Hall Farm which runs alongside Dunnington Lane. Michael Bomford, who was born at The Orchards, Salford Priors, went to live at Lansdowne, a red brick house at Harvington on the road to the Lenches, just beyond the Black and White Garage (formerly Marsh’s Garage), after his marriage, 1938-40. He took Tot Hall from Hugh Morton in 1937, including the farm land and cottage occupied by Frank Bennett, his foreman. In 1940 he took the farmhouse and land at Dunnington Farm from Len Sisam. The farm had previously been occupied also by Reg Bomford, son of Henry Butler Bomford of Exhall Court, and later by a Mr. Buttler who was removed by the War Agricultural Committee. Michael farmed about 1,000 acres at Dunnington, in addition to his interest in Cutler and Bomford and The Orchards, which he later inherited together with the fruit land at Haselor and Hampton. He claims to be one of the few Bomfords who have remained as farmers, being direct descendents of Benjamin Bomford of Pitchill. 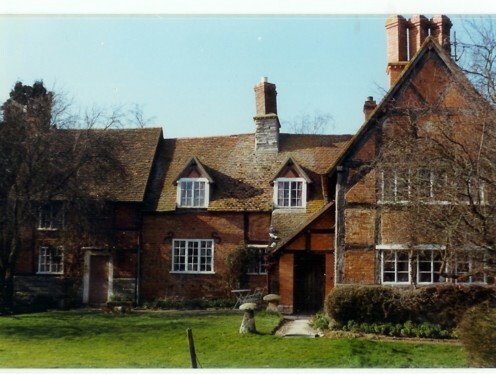 Michael was educated at Greenhill School and then at The Priory, Malvern, which moved to Woodnorton under the joint headmastership of Mr. C. H. Giles and Mr. Walter Allen. While there he had the distinction of bowling out F. R. Foster, one of the famous cricketing family, in the parents match – first ball! He also won the Victor Ludorum cup in athletics on two occasions and was a powerful sprinter. He went on to No.4 house at Malvern College and was in the first eleven soccer team. He left school comparatively early to take up farming, and he has remained in this profession all his life. He was a keen horseman in his younger days and rode in point to points and hunted with the North Warwickshire pack. However, his true love was shooting and he became one of the best shots in the district. He revived the organized shoots at The Orchards, and managed the shoot for the syndicate which leases the Ragley shoot from the Marquis, where the head keeper is Ted Addison of Dunnington. Michael was also a keen cricketer and used to raise a team at Salford to play visiting teams from Malvern Collegeand villages around. He was Chairman of the Agricultural Research Station at Luddington for many years and retired in 1981. He has been a non-executive Director of Bomford and Evershed for many years and is a major shareholder. He became an expert market gardener and grew vegetables of high quality. As farming methods changed he saw many of the fruit trees planted by his father and step-father uprooted, and corn and other less labour-intensive crops replacing them. A large corn dryer was put up to house the new crop. He always had a reluctance to terminate the service of men on his farm and many were kept on in a part-time capacity as gardeners etc., well into their seventies. He also employed a number of women in part-time jobs, pulling onions and sorting apples. Michael recalls hunting with the Croome Hunt as a boy and in 1945 with the West Warwickshire Hunt, which was run by Alan Cadbury from Coughton. Later the Hunt was run by a committee, but really by Capt. Dronsfield on the Stratford side and Michael on the Ragley side, working as Joint Masters. Michael rode in the Members Race at Alcester Heath Point to Point and finished third. He rode in the colours of Malvern College first eleven soccer team, green and white with a maltese cross on the front, also green and white. He remembers hunting over the fields now covered by houses being part of Redditch. The shoots at The Orchards were held in the old style with a glass of sherry at lunch, followed by a large joint of beef or lamb with ample vegetables. The meal was rounded off by Stilton cheese and a glass of port, followed by coffee and a coxs’ orange pippin to take with you. Tea was often provided at Salford Lodge where Uncle Pip Hughes and Aunty Daisy offer hospitality, assisted by John and Kath Hughes. So the traditions of the shooting party have been carried on as in the old days. During the war Michael joined the Home Guard and Major Warner used to ring with messages for Michael, who was somewhere in Harvington one evening when there was a report that German parachutists had dropped on Woodnorton, at that time used by the B.B.C. The house was set on fire with incendiaries people thought, but it was a false alarm and the fire was caused by an electrical fault. A few bombs were dropped in the area and once a nursemaid threw herself over Norris, their elder son, to protect him when the bombs were heard falling. Ever since John Profumo was M.P., both Michael and Louise were staunch supporters of the Conservative Party and they arranged very many fetes and fund-raising activities at The Orchards and Dunnington. The Profumos came to Dunnington several times and Michael was the Chairman of the local Conservative Association for many years. Michael married Louise Frederique Keuchenius on 9th March, 1938. Louise was born in 1916 at Lolboek Pakam on the east coast of Sumatrain the Netherlands, East Indies, where her father Willem Herman Keuchenius was High Commissioner in the Colonial Service. He came from a family which had served for several generations in the judicial and diplomatic services. Louise was educated in Sumatra until the age of 10 years with her brother Wim, and sister Hans, at Soengei Dadap, and then she returned to Holland to school in Arnhem. She came to stay in Salford Priors with Mary Evershed and met Michael at a fete at Park Hall. 1. Norris Gordon Benjamin, born 1939, educated at the Elms and Malvern College, became an engineer. Married Rosalie Hinds at Malvern in 1973. 2. Susannah Louise, born 1941, educated at Lawnside School, Malvern, also at Severn SpringsSchool in Cheltenham where she was Head Girl. Susan also spent some time in Paris learning the French language. She was a keen tennis player and competed at Junior Wimbledon. Married in 1962 to Nicholas Yeatman-Biggs. They live at Long Hall, Stockton, Wiltshire in a family home and farm several hundred acres, owning a number of houses in the village. Nicholas and Susan have three children, Harry, Annabelle and Huyshe. 3. George William Benjamin, born 1946, educated at The Elms and Malvern College. Later he studied agriculture at Cirencester College. After working for a time for a firm supplying farming equipment George joined his father working on the farms at The Orchards and Dunnington. He played a major part in setting up the “Pick-your-own” business and the farm shop. He was a keen member of the Territorial Army for several years. George lived at Holly Lodge for several years but then moved back to Old Dunnington Farm.